Have you ever wondered what else you could possibly need to fully kit out your ride? If you’ve got the two most important pieces like your helmet and sliding gloves sorted- there are a couple of other things you can do to give yourself full customization ability over your longboard. Different types of bushings, bearings, lights and protective knee and elbow pads are all perfect to help you create a unique board and riding experience perfect for yourself. We’ve gone ahead and found some of the best accessories for your ride to make sure you’re safely riding around in style and comfort. Often one of the most overlooked and least understood component of a longboard, the bushing can play a massive role in what type of ride you’re going to be getting from your longboard. By fine tuning the setup of your bushings, a difference of absolutely loving or hating your ride can be made. 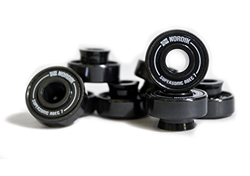 While factory bushings are all designed with a “one size fits all” mid set, it is simply not applicable to different types of riders with different heights and weights. So, for a better and more unique ride to suit your style we strongly suggest you try and play around with a few different configurations to see what fits best. Here’s a great little item to help you make your ride perfectly suit your style and needs. 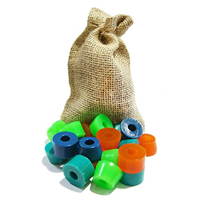 Cheap and affordable with a huge variety of different bushings, this kit is perfect for anyone looking to experiment and try different bushings at a low cost. While they may not be the highest quality you can find, this kit is sure to help you figure out a ride that suits your style more personally. Fast or slow, the choice is entirely yours on what type of longboard bearings to be using for your board. Are you trying to hit any new records speeding down the local slope? Or looking for a more fine-tuned bearing to help refine and slow down your skating speed. Regardless, by purchasing the correct type of the bearing for the type of skating your looking for – you’re guaranteed to have a perfect and unique ride. Which are a popular choice because of their built-in spaces to reduce vibration and friction as well as any annoying cheap rattling sounds while skating. Also known for being perfect for smooth riding on a whole bunch of different and varying terrains. Stable and high quality, these are also guaranteed to help give you a smoother and cleaner ride. Let’s be honest here and assume you’re going to fall at least once and hit the pavement a little. So, it would make sense to ensure you’re kitted out with a decent amount of protection to help you walk off your big crash and try again. Knees and elbows are often the most damaged joints seen in skating and especially longboard injuries due to their hard-bony surfaces that are generally the first part of the body to contact the ground after a fall. 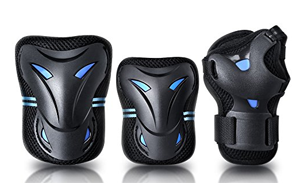 So, a nice hard shell lined pad that can comfortably and easily cover your joints is the perfect way to go when it comes to making sure that you won’t have to be visiting the doctor anytime soon. Herse a decent adult sized kit for helping to reduce the impact and damage of a fall. 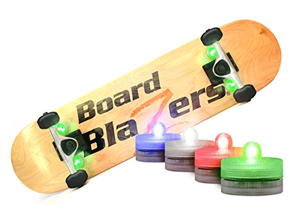 Okay so while this may not be the most essential accessory out there, if you want to help make yourself and your board standout we can then definitely recommend you should start considering accessory lights for your longboard. With a huge variety of different colors and combinations this is a sure-fire way of jazzing up your boring old board. As a side note as well, how cool would these be skating in the dark!? Extremely cool. So yeah, if you’re maybe looking for that little something extra just to tie everything together into an awesome and relatively affordable way to jazz up your board – accessory lights are the way to go. Check out Board Blazers and grab the OG. Got a bunch of boards lying around taking up space? How about you up the storage space and get an awesome feature for your wall in your room or house. Wall mounted racks are perfect for bringing a bit of style to your room while also getting your boards off the ground. Easy, cheap and cool – what more could you want!? 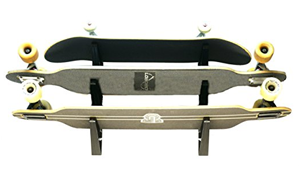 The mounted racks can carry a varying number of longboards and are perfect for keeping your boards off the ground and in tip top shape. Check out this rack by StoreYourBoard. While there are a ton of cool things on the market you could buy to help personalize your longboard, at the end of the day it will all come down to what you like and what you want. It’s always best to prioritize quality and practicality over anything else when looking for accessories. If you ever do decide to do some extra customization and accessorizing just always make sure that the board is in perfect working order after you’ve put all the new bells and whistles on before hitting any big hills this weekend! LongboardingGuide.com is a participant in the Amazon Services LLC Associates Program, an affiliate advertising program designed to provide a means for sites to earn advertising fees by advertising and linking to Amazon.com. 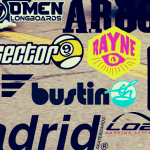 © 2019 Longboardingguide.com - All rights reserved.